The Golden Princess cruises through the South Pacific from Australia, New Zealand and Asia in the summer months, then homeports in Alaska for winter. The sister ship of the Grand Princess and Star Princess, the Golden Princess is famous for her great range of onboard entertainment. Enjoy a signature Princess show featuring some of the most famous performers at sea. Enjoy all the latest blockbusters at the 'Movies Under the Stars' cinema. If you're feeling lucky, why not spend an evening in the Casino? Or if dancing is more your style, there are plenty of nightclubs, bars, and lounges on board! There is something for kids of all ages on board with the Golden Princess youth programmes and kids clubs. Teen lounges, where your kids can engage in their own science experiments and roller coaster building activities. 'Pete's Pals' programme is available for younger kids. There is also a video arcade, shuffleboard, and nine-hole putting course and much more available on board. While the kids entertain themselves, you can choose to relax in the exclusive Golden Princess 'Sanctuary' or 'Lotus Spa'. As with all Princess ships, the Golden Princess offers a variety of different Inside, Outside and Balcony Cabins. A great number of luxurious Suites and Mini-Suites are also available for loftier standards. 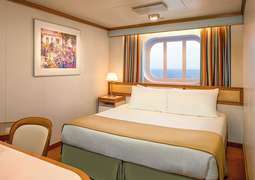 Over half of the cabins on board have their own private balcony that offers additional comfort with a fresh sea breeze. This diverse selection makes it nearly impossible not to have every wish fulfilled. 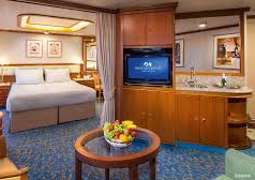 All the cabins on board the Golden Princess are known for their great colours, friendly design, and pleasant, homey atmosphere. The restaurants on board the Golden Princess offer a great variety of dining options. Enjoy succulent shellfish at the Crab Shack, grilled burgers and hot dogs at the Crown Grill, or visit Sabatini's for Italian specialties. The Donatello and Bernini Dining Rooms are open outside of the regular meal times, giving you the freedom to eat when you please. The Horizon Court, a 24-hour buffet restaurant, goes even further in providing fine dining around the clock. You could even have a romantic meal on your private balcony if you please. A wide selection of smaller meal and snack options is also available in diverse bars and cafés, such as the Vines Wine Bar, Sundaes Ice Cream Bar, and the Pizzeria Prego. Coffee, tea, water, and iced tea are free of charge in all buffet restaurants. The Golden Princess provides ample opportunities for fun and entertainment. Enjoy performances from internationally known artists, visit the Princess Theatre, test your luck in the casino, or catch the latest films at the Movies Under the Stars. Dance the night away 150 meters above sea level in the Skywalkers nightclub, or spend a cosy evening in the Wheelhouse Bar or Promenade Lounge, among many other fine locations. Children and teens will also be sure to get their fill of excitement in the 2-story Kids’ and Teens’ centre. Whether you’re looking to keep in shape on your holiday or to simply relax, both are possible on board the Golden Princess. Art enthusiasts should definitely pay a visit to the art gallery and maybe bid on a unique piece of artwork at an auction. A great variety of workout options are also provided. Go for a run on the athletic track, shoot some hoops at the basketball court, or power up in the Lotus Spa’s sports hall and fitness studio. Then cool off again with a swim in one of the four pools on board. Casual clothing is most practical for warm weather, while warmer, smart-casual clothing is recommended for evenings. More elegant, fancier clothing is advisable for special occasions in the à la carte restaurants. Appropriate clothing for land excursions and possible visits to places of worship should also be considered. Swimwear, shorts, etc. are not permitted in à la carte restaurants or similar public spaces. Since her birth in 2001, the Golden Princess has honored millions of passengers, taking them on a holiday that would never be forgotten. Even being more than a decade old, this 108,865 ton vessel has a modern yet sophisticated theme on board. She was refurbished in 2015, adding a buffet restaurant on board while also mending some spots that were showing some wear. Ideal for all ages, this ship offers a wide range of entertainment and activities for everyone. The is one of the most enjoyable ships from Princess Cruises. 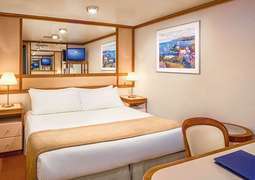 There is a wide range of staterooms on board the Golden Princess. With the choice between seven different types of rooms, you are sure to find the perfect one. 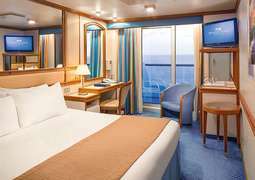 The most popular room is the balcony cabin which has 250 square footage of space complete with everything you need to have a comfortable stay. There are several types of family rooms and also rooms with wheelchair access so bring everyone along. Enjoy the touch of luxury with daily cabin service in all rooms. The Golden Princess is packed with different options on where to dine so you are never stuck for choice. Let the men get suited and the woman get dressed up before heading up to the elegant Canaletto Dining Room to dine traditionally. Or if this isn’t your style, dine anytime in either of the two other dining rooms where you can choice what tickles your taste buds from a wide ranged menu. Have a taste of Italy while enjoying lunch in Sabatini’s Italian Trattoria or munching on a poolside pizza from Prego Pizzeria. With several other eateries from steak and seafood to 24 hour room service, you are assured to find everything to satisfy your carvings.